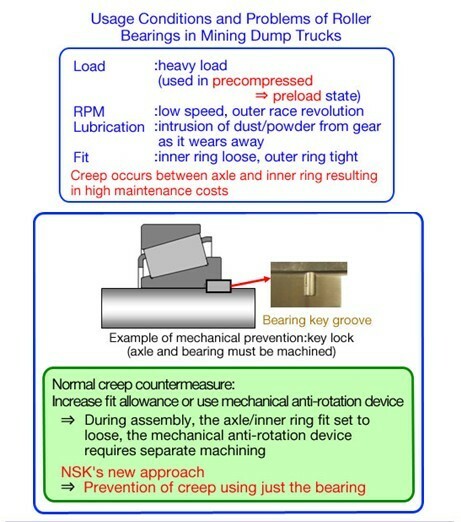 NSK Ltd. (NSK; Headquarters: Tokyo, Japan; President and CEO: Norio Otsuka) today announced that it has developed a highly reliable anti-creep design roller bearing for preventing the axle wear due to inner ring creep*1 that occurs in tapered roller bearings used in the wheels of dump trucks for mining operations. With the development of this product, NSK will contribute to improved maintainability and higher reliability. NSK is targeting one billion yen in sales for this product in 2016. *1: Inner ring creep: Slip phenomenon that occurs between the inner ring and the axle. Creep can lead to wear between the axle and the bearing bore. With the continuing global trend toward urbanization, global demand for natural resources continues to expand, especially among the BRICs (Brazil, Russia, India and China) and in developing countries. In recent years, this had led to mining operations running 24 hours a day, 365 days a year, which in turn requires equipment that is highly reliable under such extreme conditions. 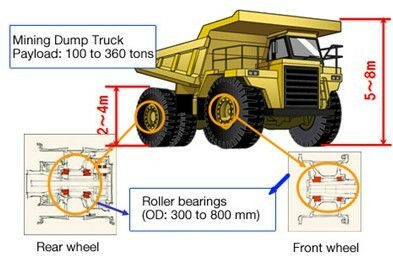 Normal tapered roller bearings are commonly used in the wheels of mining dump trucks, but inner ring creep can easily occur, resulting in axle wear. Repair of the axle wear, in turn, requires frequent maintenance time and extra expense. As a conventional countermeasure for this, dedicated anti-creep mechanisms have sometimes been used. 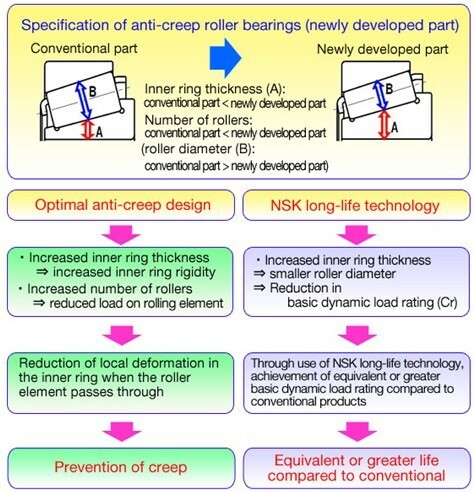 However, thanks to its advanced analysis technology, testing and state-of-the-art production technology, NSK has produced a solution that involves only a specification change to the bearing itself. The result of this approach is eight times the anti-creep performance of conventional products, reduced axle wear and improved maintainability. Furthermore, NSK employs a special heat treatment process to realize increased resistance to surface fatigue on both the inner and outer ring, resulting in equivalent and greater life compared to conventional products. Through analysis of the tapered roller bearings often used on mining dump trucks, NSK realized that local deformation was occurring in the inner ring when the rolling element passes under a high level of load, which was resulting in inner ring creep. As a result, NSK increased the thickness of the inner ring and increased the number of rollers to reduce the load on the rolling element, thereby reducing local deformation in the inner ring and significantly limiting creep. This product achieves improved maintainability and higher reliability for mining dump truck wheels, which in turn results in better productivity.